Goal: Test WiFi MU-MIMO station Download, one 2x2 station, one 1x1. Test WiFi MU-MIMO station Download using two MU-MIMO capable radios. One radio will emulate a 2x2 station, and a second will emulate a 1x1 station. When testing MU-MIMO, only a single station can be used per radio. 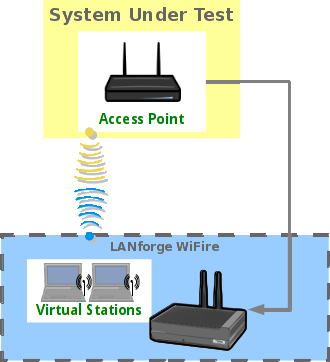 For additional non-MU-MIMO station emulation, additional radios can be configured for multiple station virtual devices. This example uses a system similar to the LANforge CT525 system. It is configured with 4 radios: Two of the 4x4 MU-MIMO radios are used for MU-MIMO testing. The other two are not used in this test scenario. This procedure should work on any system that can support at least 2 of the 4x4 wave-2 radios. The AP in this test is a Netgear R7800 configured in bridging mode. This feature requires 2 wave-2 WiFi network cards and LANforge release 5.3.5 or higher. Configure Radios and Station devices for MU-MIMO capabilities. 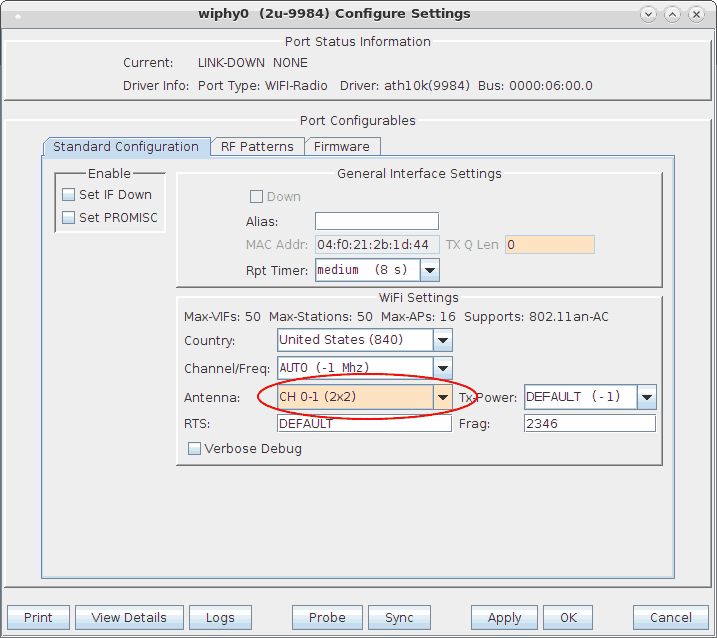 Go to the Port Manager, select the wiphy0 interface, and click Modify. Configure the radio for 2x2 MIMO and click Apply. Select the wiphy1 interface, and click Modify. Configure the radio for 1x1 MIMO and click Apply. 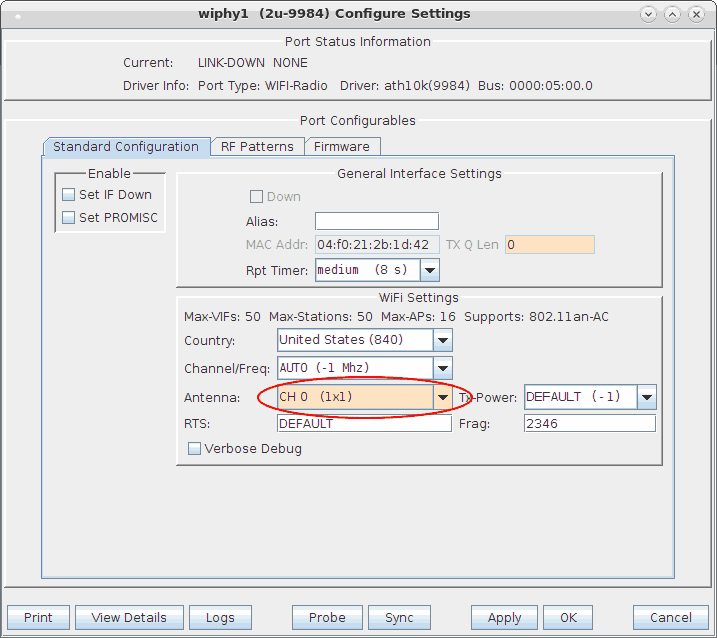 For both wiphy0 and wiphy1 ensure that the firmware is configured properly for MU-MIMO. The Port Status Information section at the top should mention the 9984 chipset, as other hardware may not support MU-MIMO. Normally the best option is to go into the Firmware tab, click the Customize Firmware box, click the top Firmware Defaults for chipset: 9984 button, and then select Allow MU-MIMO. Please note that selecting MU-MIMO disables a feature that allows multiple virtual stations to work properly on a single radio. So, when you are done with MU-MIMO testing, you should probably change this selection back to Software Decrypt settings. 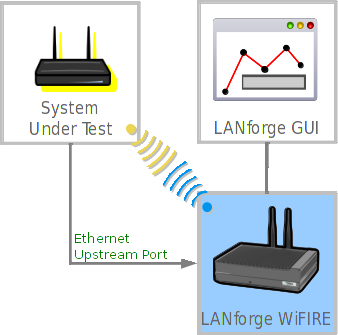 Select the wlan0 interface, and click Modify. Configure the station for proper SSID, password, etc, and click Apply. 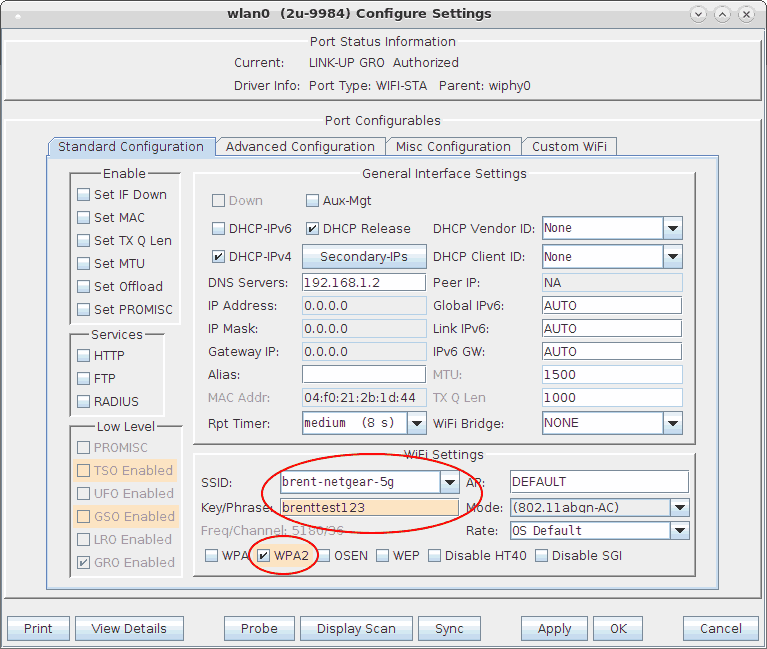 Do the same configuration for wlan1. In this scenario, we are using eth1 as the upstream port. Ensure it is configured properly. In this example, it is actually configured to serve DHCP using a virtual router and the Netsmith feature in LANforge, but for simplicity, it is normally best if you use the AP as DHCP server or just use fixed IP addresses for eth1 and the wlan interfaces instead of using DHCP. Create Layer-3 UDP Download traffic flows. Go to Layer-3 tab and click Create to build a UDP connection. Select the Protocol, ports, rates, and use Multi-Conn 1 so that separate processes are created for optimal throughput performance. 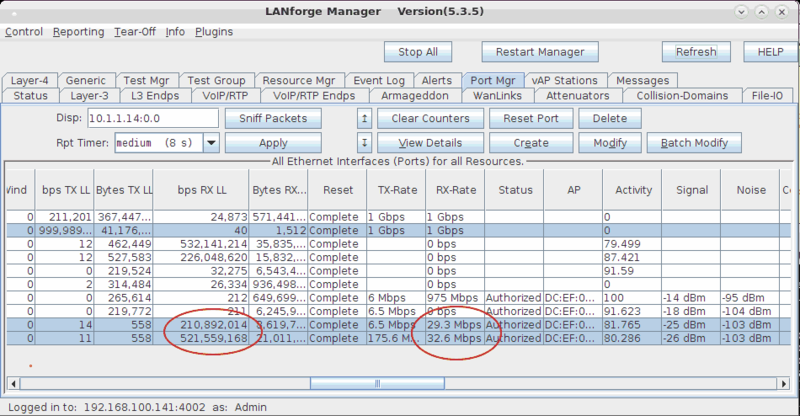 Create a second one for the wlan1 interface, with download speed of about 450Mbps since it is only 1x1 MU-MIMO. You may need to adjust the + - buttons at top left to show the section containing Multi-Conn settings. Start the test by selecting the connections click Start. We see about 500Mbps on wlan0 (2x2) and 200Mbps on wlan1 (1x1). For best results, you may need to tune orientation of the first two antenna on the wiphy0 radio and the first antenna on wiphy1. In addition, it can take a short amount of time for the rates to reach maximum throughput, so you may wish to clear the counters after around 15 seconds of running to make sure the averages do not include the initial ramp-up time. It can be a bit difficult to know if MU-MIMO is working properly. In general, if you disable MU-MIMO in the AP, then aggregate throughput should decrease significantly. In addition, the current firmware and/or driver is unable to properly report RX encoding rates for MU-MIMO frames, so it always reports low rates. If you see total throughput that is greater than the reported RX Rate, then likely the system is receiving MU-MIMO frames from the AP.